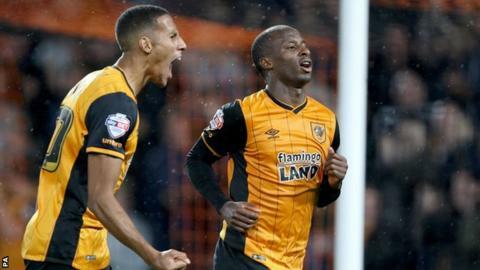 Sone Aluko's late winner against Fulham saw Hull move level on points with Championship leaders Ipswich. Ahmed Elmohamady gave the home side the lead, heading home from an Andrew Robertson cross in the 34th minute. Former Hull favourite Tom Cairney brought the away side level with a stunning strike from 20 yards that flew past Allan McGregor. But Hull rallied and Aluko's close-range finish after a Nikica Jelavic knock-down was a deserved winner. Fulham goalkeeper Marcus Bettinelli and striker Matt Smith both suffered knee-ligament damage in a collision just before half-time. England Under-21 international Bettinelli raced off his line to close down Hull forward Abel Hernandez and ran into his team-mate, with both players having to be replaced. Kit Symons's side slip to 21st in the Championship table, just above the relegation zone with one point from their first three games. Hull City manager Steve Bruce: "If we've got what we've got now then I'm very, very confident we'll mount a challenge. "If we lose another four or five then we're goosed, that's my fear. That's being brutally honest and that's what we need to guard against. "We showed a bit of resilience, and we didn't really play well in the second half after the first-half dominance. We're unbeaten since we've been back, so we're starting to get a little bit of confidence." Fulham manager Kit Symons: "In the second half, we really upped our game; played on the front foot, took the game to Hull and scored a very good goal. "We're in the ascendancy then. To then go and lose it from that position is hard to take but it's only three games in and I'm sick of saying the same things already. "It can't be down to fitness, it must just be down to concentration, not being street-wise enough. It's costing us dearly and it needs to change." Match ends, Hull City 2, Fulham 1. Second Half ends, Hull City 2, Fulham 1. Offside, Hull City. Ahmed Elmohamady tries a through ball, but Sone Aluko is caught offside. Nikica Jelavic (Hull City) wins a free kick on the right wing. Foul by Kay Voser (Fulham). Jamie O'Hara (Fulham) is shown the yellow card for a bad foul. Delay in match Isaac Hayden (Hull City) because of an injury. Isaac Hayden (Hull City) wins a free kick on the right wing. Foul by Jamie O'Hara (Fulham). Substitution, Fulham. Alexander Kacaniklic replaces Ben Pringle. Goal! Hull City 2, Fulham 1. Sone Aluko (Hull City) left footed shot from the centre of the box to the centre of the goal. Assisted by Nikica Jelavic with a headed pass. Corner, Hull City. Conceded by Moussa Dembele. David Meyler (Hull City) wins a free kick in the attacking half. Foul by David Meyler (Hull City). Attempt saved. Ross McCormack (Fulham) right footed shot from outside the box is saved in the bottom left corner. Moussa Dembele (Fulham) wins a free kick in the attacking half. Attempt blocked. Sone Aluko (Hull City) left footed shot from outside the box is blocked. Assisted by Andrew Robertson. Hand ball by Ross McCormack (Fulham). Substitution, Hull City. Nikica Jelavic replaces Chuba Akpom. Goal! Hull City 1, Fulham 1. Tom Cairney (Fulham) left footed shot from outside the box to the top right corner. Assisted by Lasse Vigen Christensen. Attempt saved. Ross McCormack (Fulham) right footed shot from the centre of the box is saved in the centre of the goal. Ben Pringle (Fulham) wins a free kick in the defensive half. Attempt missed. Moussa Dembele (Fulham) header from the centre of the box is high and wide to the left. Assisted by Jazz Richards with a cross. Substitution, Hull City. Sam Clucas replaces Abel Hernández. Attempt missed. Shaun Hutchinson (Fulham) header from the centre of the box is too high. Assisted by Ben Pringle with a cross following a corner. Corner, Fulham. Conceded by Curtis Davies. Nikolay Bodurov (Fulham) is shown the yellow card for a bad foul. Foul by Nikolay Bodurov (Fulham). Attempt blocked. Kay Voser (Fulham) right footed shot from outside the box is blocked. Assisted by Ben Pringle. Mourinho - deluded or distracted?